Everything we design, teach and do is done to serve these ethics, & the Network was created to encourage more cooperation in serving them increasingly better. to the Eco paradigm, which comes from the greek οίκος (ikos), which means house, home: which positions us as carers and cooperators on Gaia (the planet, together with all the other species & complex self-regulation systems it contains). This mind & culture change can be accelerated with good teaching and good example, but especially requires a community that keeps us accountable, that supports us in living our consciously chosen values (not the unconsciously implanted ones), that reminds us how & when we do our own versions of 'ego v. eco' (we all have them! ), and which very lovingly encourages us in learning from our mistakes. 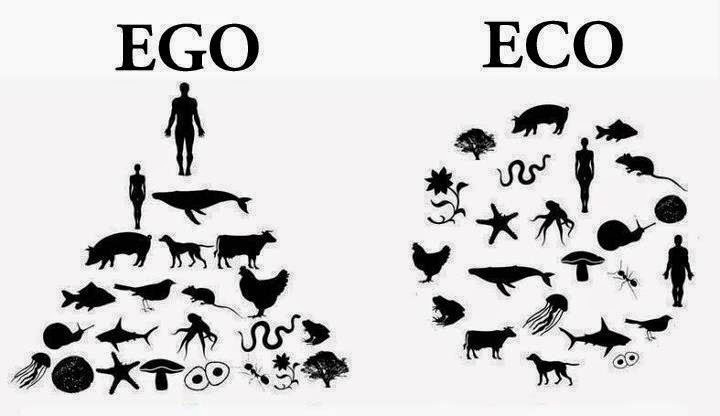 It is very urgent that we learn to live fully as Ecoists instead of egoists, now more than ever. Because it is precisely the dominant 'me, me, me' mentality & culture which has brought us the social, environmental, economic & also psychological crisis which surround us today. thinking about what concerns us globally (us as in all people and all species), & therefore to do what is most fair, intelligent & productive, even if it's more difficult, at least to start with. Because in the long term it so happens that it's a lot easier to live in harmony with Nature, & it is a lot more pleasant & productive to be in peace than in war with other species, as well as at constant war and competition (in the battle for resources that our exploitative economy traps us into) with other human cultures. We need a clear & shared map of values in order to guide us in our path to exit the DestructoCulture*, as people, as families, as communities, as a culture & entire society. 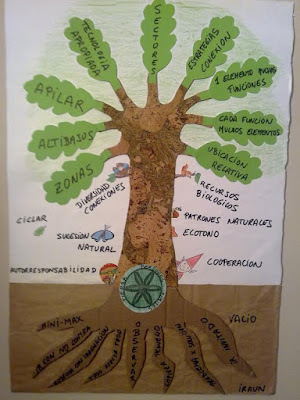 Right at the beginning of each basic integral permaculture course each student expresses their creativity in creating their own version of this 'permaculture tree', which is basically a mind-map which summarizes the Ethics, Directives & Principles - the roots, trunk and branches are respectively the actitudinal, ecological & design principles - which guide us. The Ethics are the seed from which all of this tree germinates. The tap root is Observation: deep, thorough and protracted observation as an actitudinal principle. ... so please do come back to see later if you want to know more about how we envisage the values of the EcoEscuelas Network. And if you want to offer feedback, suggestions or ideas, tell us in the Facebook group.